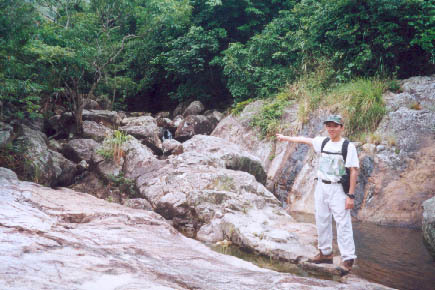 This stream runs from Nei Lak Shan (彌勒山) to Sham Wat(深屈), that's why it is called Nei Sham Stream. 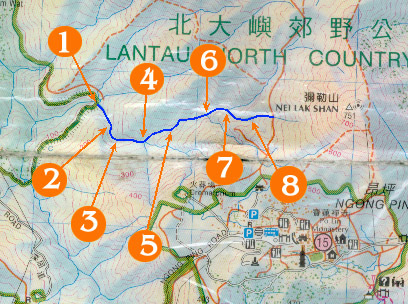 The stream next to this Nei Sham is the notorious Ngong Sham stream (昂深石澗) which is a 5 stars stream. Make sure you won't take the wrong turn unless you really want to. You may find a deep pool shared by Ngong Stream and Nei Sham Stream but it is not geared for swimming because Ngong Sham Stream is rather polluted. This is the entrance of the Nei Sham and Ngong Sham stream. The entrance lies on Sham Wat Road. 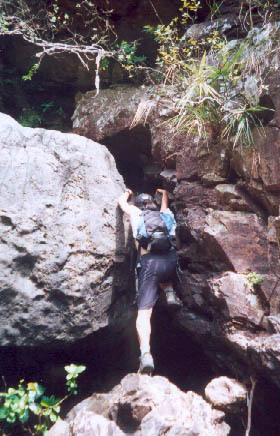 Not too far from the entrance, there lay many huge rocks that make your beginning difficult. 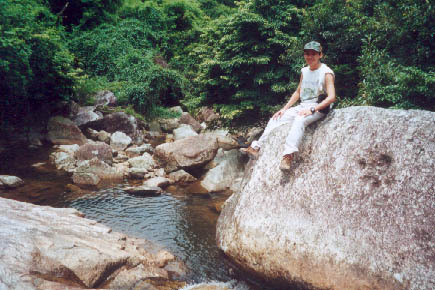 After passing the area of big rocks, the stream get milder. 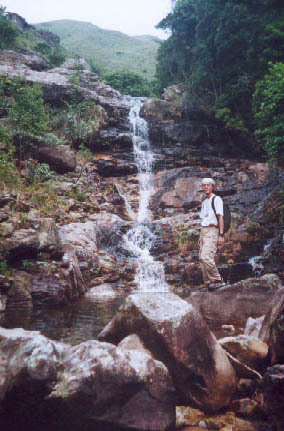 This is biggest waterfall on Nei Sham/Ngong Sham stream, called Nei Ngong Waterfall (彌昂飛瀑). It is about 15M in height. The water pool beneath the waterfall is rather big. But again, you are discouraged to swim here because the upper stream of Ngong Sham is polluted. One can overcome the waterfall using the rocks on the left. The guy below is posing on the left of the waterfall. 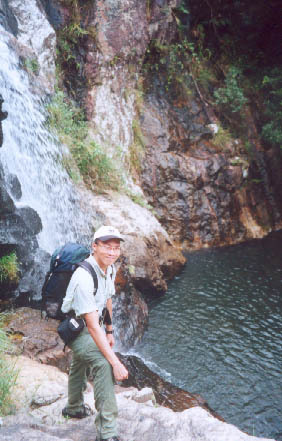 At this height, the water flow splits, the left one is Nei Sham Stream and the right is Ngong Sham Stream. This time we take the left one. 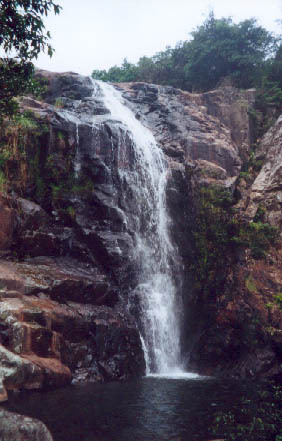 A waterfall with black cliff. Here we'll find some big rocks blocking the way. It could be strenuous to crawl through those rocks. Here the water flow splits again. It is all up to you to select which way to go. 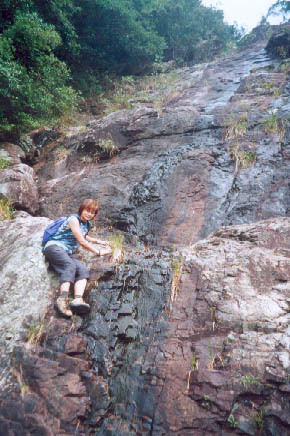 This time we have choosen the right one because it has a very tall rocky cliff for climbing. One can scale up this cliff on its left side. 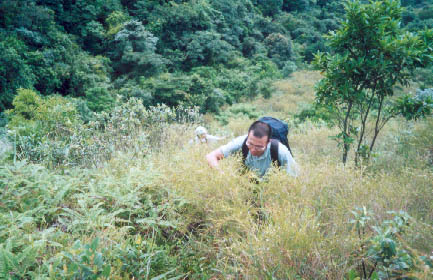 As you go higher, the stream dies out in thick vegetation. We finally leave the faint water flow and dash into thick scrub. This may be the most exhausting part of this journey. 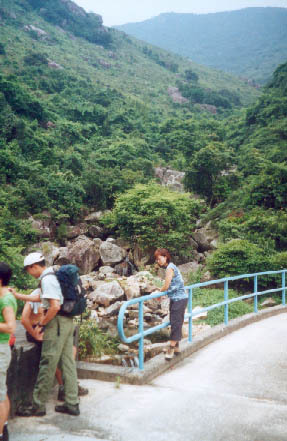 At 460M you will reach the proper hiking trail which takes you back to Ngong Ping (昂平).